Are you one of those frequent travelers? If you are worried about booking your train tickets, this is the right place to find answers. We would help you with respect to Tatkal Booking Timings. Have you faced any difficulty in booking tickets through Tatkal? We will explain how to book Tatkal Railway ticket with ease. You should be able to book Tatkal tickets quickly after going through the steps indicated in this article. 1 How to Book Tatkal in IRCTC? 4 Are there any extra charges applicable for Tatkal booking through IRCTC? How to Book Tatkal in IRCTC? Tatkal booking system had the timings stipulated between 10 am to 12 pm. Due to this, users faced heavy traffic on the site and as such had to be disappointed and end up without being able to book tickets. Thus, to avoid the heavy rush, IRCTC recently updated the Tatkal Booking timings. Tatkal, for the uninitiated, is the Hindi word that means “Immediate”. And true to the meaning, Tatkal lets millions of users to make use of online Tatkal booking with ease. The Tatkal made its beginnings in 2014 as an online only service. However, now, the service is available both online and offline. There have been two different tiers of Tatkal bookings available now – Normal and Premium. 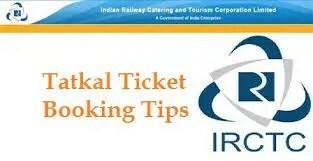 We will get to know the New Tatkal Ticket Rules and explain how to make fast booking in IRCTC in Tatkal scheme. The Tatkal booking timings start one day in advance. Moreover, in view of the heavy rush and load on servers. IRCTC frequently updates the rules and changes the Tatkal booking timings quite frequently. So, let us go through the schedule as it stands today. IRCTC has stipulated the timings for the Tatkal bookings between 10 am to 12 pm every day in 2016. However, in view of the heavy rush, the booking window is changed to one hour per day. The Tatkal booking time has been updated at two separate intervals for Sleeper Class and AC Class. Here are the details of how to book Tatkal tickets in advance. AC Class – You can book Tatkal railway ticket for the AC Class from 10 am to 11 am. However, you can book the tickets one day in advance. Sleeper Class – Sleeper Class Tatkal booking starts from 11 am every day. This again has a window of just one hour every day. You can book your Tatkal ticket one day in advance. However, the Tatkal booking timings indicated here are as per the latest updates available from IRCTC Tatkal booking website. If the timings change further, we will update the post accordingly. You can book The both online and offline. Tatkal booking online and offline does not have any difference as long as the timings are concerned. Whether you do an online Tatkal ticket booking or opting for the offline Tatkal booking through a station the charges and the timings would be completely similar. General Tickets – Timings start from 8 am every day. Sleeper Class – Tatkal bookings for the sleeper class through agents would begin at 11.30 am. Other conditions for IRCTC Tatkal booking timings through agents remain similar to the online or offline booking conditions for individuals. Are there any extra charges applicable for Tatkal booking through IRCTC? Well, yes. This being a premium booking service, you will need to pay an extra charge for the benefits that the Online Tatkal booking offers you. It would be a good idea to know about the charges applicable to you so that no one will dupe you. Yes, both Normal Tatkal booking and Premium Tatkal booking have some inherent differences between the two. As you can easily understand from the nomenclature itself, Premium Tatkal will need you to pay an extra charge for the services. Normal Tatkal Booking does not ensure you a confirmed availability of seat. Thus, you could as well end up on the waiting list if you are not lucky enough. Premium Tatkal booking, on the other hand, ensures that you get a confirmed ticket. The Premium Tatkal booking has no waiting list. Before we sign out, we would want to share a few FAQs concerned with Tatkal railway ticket booking so that we can clear most of your doubts. Q – Can I Book a Tatkal ticket online? A – Yes, You can book a Tatkal ticket online. You will need to login to your IRCTC account at the stipulated time. Moreover, you can make payment through net banking, credit/debit card or PayTM wallet. Q – How many Tatkal tickets can be booked from one ID? A – You can book a maximum of 2 Tatkal tickets online from a single IP address per day. If you attempt to book more than two tickets, you will get an error. However, you can try booking more than two tickets using different accounts. Q – Can I book Tatkal tickets online anytime in the day? A – No, you can book your Tatkal tickets only between 10 am and 11 am. Moreover, the timings remain similar across online booking and counter booking. That is all we have about Tatkal bookings and the allied information. We assume we have answered all your queries with the requisite details. However, if you still have any queries, you can share the doubts you have with us through the comments here below. We promise to answer your questions with all our efforts. And Keep visiting Bulletintech for more such information filled articles.